Biorhythm of wakefulness and sleep is better known as the circadian rhythm and is subject to much more body things than sleep and wakefulness. The word circadian means "lasting about 24 hours" ( circa ≈ around, dies ≈ day). It is in the interest of our health that this rhythm be in line with civilian times. Today, it is very easy to mock this rhythm with artificial light, which has become one of the many toxic factors of today's environment. How to reverse it has been the subject of long discussions at the Department of Physiology UK's seminars, the content of which is the basis of this story. Find out what time your inner clock shows. It's not hard. Just watch when he starts taking you to sleep. This is the moment when the pineal gland led by the signals of the inner clock releases into the bloodstream the hormone of the night, melatonin. Subjective midnight occurs about 4 hours later. Set your alarm clock for 2.5 hours after the subjective midnight . Or in other words, 6.5 hours after you started sleeping. Turn off and go to sleep. When you start sleeping, then when you adjust the alarm, you should turn off all the lights if you have not left them before and go to sleep. After lying down, do not shine. Until the alarm sounds, you must avoid white light, even if you are having trouble sleeping. This is an absolutely absolute requirement. Only weak red or yellow-red light is allowed, not a brighter small fire. The white light must not shine for more than 30 seconds. When the alarm rings, light up the white light and watch for 3 minutes. Not close, of course, from a safe distance. This is the very step that moves the circadian clock. Turn off the light and, if possible, continue to sleep until the natural awakening. The inner clock should move about 15 minutes back. The next day, drowsiness and morning waking should occur 15 minutes before. In the following days, repeat the process until the desired backward shift is achieved. Measuring the time in the inner hours according to the sudden feeling of drowsiness requires that we do not use any sedatives or stimulants that would cause or drowse the sleepiness. The feeling of drowsiness should only be an indicator of the melatonin influx from the pituitary to the blood. If we are used to taking caffeine (coffee, black / green tea, energy drinks, etc. ), restoring a healthy sleep cycle is a chapter in itself - when we suddenly drop out of caffeine, we will want to sleep for a couple of days. During this time it will not be possible to find out what time our natural circadian clocks are showing. Adjusting the inner clock is important when the retina sees white light and darkness, not whether the brain is in a state of sleep or waking. Evening use of sedatives in the internal time does not in itself move. It can only be attributed to the fact that when we have closed eyes when we are forced to sleep, less light comes into the retina. The effects of drugs like sedatives, caffeine and others on circadian rhythms are not properly studied. So far I would only say that the exception to the rule that the sedative biorhythm does not directly move can be melatonin itself, which is commercially offered as an atypical sedative and an antioxidant. Scheme of pink synchronization according to light signals from the retina (rat brain). Modified by Moore1996ncp . Circadian rhythm resides in the suprachiasmatic nucleus of the hypothalamus ( nucleus suprachiasmaticus SCN) and receives information about the light path through the ancient retinohypotalamickou (i.e. leading from the retina to the hypothalamus). This path is a small volume, forming only a few glutamate fibers. But it has a big impact on our lives and features such amenities, it is as if he had a personal computer in addition to regular keyboards have a special keypadwith ancient Greek numerals intended only for adjusting system time. The light signal does not come from suppositories or sticks, but from a number of retinal ganglion cells. They do not use rodopsin sticks or one of the three iodopine suppositories to detect light, but have a fifth light-sensitive pigment, melanopsin, to their exclusive use. (a few more details can be found in the Biophysics literature from Helena Uhrová, see available from the Institute of Chemical Technology , where melanopsin does not mention). This pigment is particularly sensitive to the blue part of the light, so it responds well to the sun, while the light of fire ignores it too much. It also activates light from bulbs, fluorescent tubes, screens and white or blue diodes. The feeling of drowsiness, as well as other body processes, is related to the spilling of melatonin from the cerebral pineal gland (epiphysea, corpus pineale ). Once upon a time, the cerebral plexus itself performed the function of the third eye - it had light-sensitive cells to adjust the internal clock through the sunlight penetrating the thin translucent skull into the brain. This is still the case with the litter and some birds. 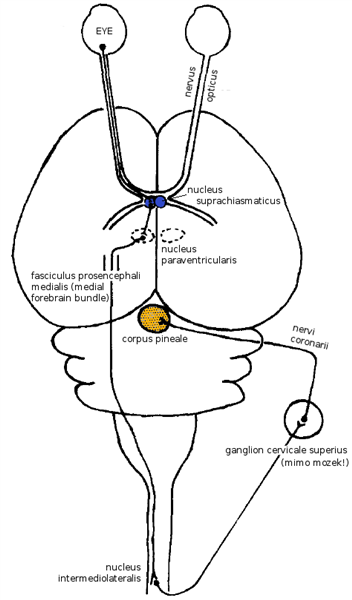 However, in our giant head, but in the skull epiphysis, no light penetrates, and therefore it must be given second-hand daytime information, a zigzag circuit emerging from the suprachiasmatic nucleus of the hypothalamus ( Moore1996ncp , see diagram on the right). From the above, one of the simplest things we can do for our physical and mental health is to stop ruining the circadian rhythm. It is the easiest way to destroy it by working late into the night with white artificial light that shifts the rhythm of sleep and waking more and more forward to the wound. In the worst case, we wake up in the room in the morning without natural light, so we do not even have the morning sun compensation to help partially reverse the shift caused by evening artificial lighting. It soon happens that we want to sleep later in the evening and we get up early in the morning. After two weeks of such a regime, we can get into sleeping while taking a white morning and waking up at three o'clock (I'm talking about experience). We can also get to the same situation by air to the east - perhaps to Australia.In the opposite direction, the relative shift of biorhythms is of course the opposite. The main rule of maintaining a stable sleep and wake cycle is to go out 8 hours before the planned morning wake. Even if we do not want to sleep. We do not have to interrupt work or entertainment, we do not have to go to sleep and we do not have to take hypnotics, but we have to remove all artificial light from where we are. Short light (even for 3 minutes) biorhythm destroys us just as much as if we were shining an hour. More precisely, short lightning will completely abolish the effect of darkness that we have previously maintained with effort. Only weak red or yellowish light is permitted without a blue and white component. When working in the dark in the computer, set the colors in the style of the red-black terminal. White light illumination must be shorter 30 seconds, the shorter the better. From the point of view of biorhythms, the most suitable red night lamps for the room, toilet and bathroom. The advantage is when the room,in which we sleep, has the morning sun. This is why the bedroom windows should be out to the east. When we use only the lights in the colors of the fire that our inner man is used to in the evening, we will keep the circadian rhythms in normal. But when our rhythm deviates, we must actively push it back. The rhythm of awakening can also be enforced by the wake-up method, as is the case with most people employed on a daily shift with fixed working hours. No matter when we went to bed, we set the alarm clock every day early in the morning for a predetermined time, and if we did not sleep enough, we would be so tired tonight that we would sleep as Sleeping Beauty just as we walk into the bedroom. The problem, however, is that this method can only be re-run safely once again after observing the extinguishing rule 8 hours before waking up. Otherwise, we come to the situation that we have a regular wake-up regime, but at the expense of permanent sleep deprivation. Here comes the most precious morning sleep when leptin is released in the brain. Lack of leptin causes more hunger over the day, not to mention sleepiness. Once again, "hardness" must be applied at dinner.If we adhere to it (or we are forced to observe it), waking up will not be needed. The luminosity before the subjective midnight shifts the internal circadian rhythm forward, the illumination back after the subjective midnight. The maximum daily shift in human clock is, if I remember, somewhere between 15 and 30 minutes. Even so, the length or intensity of light is not important (unless it is too weak or shorter than 1 minute), but especially the time when it appears. If the experimental animals live in a mode when it turns off at 6 o'clock and lights up at 6 o'clock in the morning, a brief light at 5:30 will cause a small shift of circadian clock backwards (say, 5 minutes), a short light at 5:00 will cause a larger shift 10 minutes) and so on - the closer the morning light is at midnight, the greater the movement. The lights before midnight cause an analogue clock shift, the longer the light appears. The light on exactly midnight (about 1 hour) does not cause any displacement. It does not matter if the light is short or long. Our inner clock can give a strong light at night only a single interpretation - that the sun is above the horizon. And when the sun is one o'clock at 11 o'clock above the horizon for 3 minutes, then according to the thinking of our clock machine logically it was also the whole 5 preceding hours. And when the artificial light comes on for 3 minutes at 3am, our clock machine will adjust the hands for a full step back (ie 15-30 minutes) when today's crazy sun comes out so early. The light does not matter for a few seconds, because it can be lightning storm. A bigger shift than 15-30 minutes a day our indoor clocks are not able to - with intercontinental flights or long-term overtaking in artificial white light does not count.